It has been two weeks since I left the comforts of familiarity to pursue my dreams of protecting and conserving the natural world. I have been given the amazing opportunity to work for the International Union for the Conservation of Nature at their headquarters here in Switzerland. I will be spending the next 4 months with the IUCN’s Global Marine and Polar Programme, where I will be able to finally apply my Masters degree to helping solve the real world problems that I have been studying for the past two years from the confines of a classroom. I have found it quite easy to settle into the daily life of working in a large international organization. Everyone here is friendly and welcoming, and of course, speaks a minimum of two languages, but typically many more than that. By simply walking down the hallways of the office you can hear meetings, phone calls, and discussions taking place in French, Spanish, Italian, German and English (with a British accent). It is endlessly fascinating, and of course, incredibly humbling. Every day I learn something new and I am constantly being given advice on work, languages, and travel destinations from the various internationals and locals in my department. Within the IUCN headquarters we have something called “weekly coffee trials” where you randomly get assigned to a new person in a different office to meet and chat with over a cup of coffee. It is a great way to meet new people, learn about the other departments, and build camaraderie within the organization. My “trials” have been going great and my conversations have led me to join a work “soccer” team and to make plans with other interns who wish to explore Europe as well. Of course these meetings often lead to lengthy discussions answering numerous questions about the current status of American politics and what it’s like being from a country who considers electing presidential candidates like Trump….I have already received multiple offers of safe haven should the unthinkable occur. Unlike my experiences in Micronesia, I do not shockingly stand out amongst the locals here. On the contrary, I blend in completely. It is comforting to know that I am no longer a particular target due to my appearances; however, it does come at a slight cost. Everyone thinks that I am a local and that I therefore have a concrete understanding of the three languages spoken here and of the many rules governing this beautiful country. I am not allotted the same “it’s ok, you’re new” forgiveness’s from the local people, and instead, receive looks of frustration rather than empathy when I hold up the line trying to buy a train ticket or groceries. 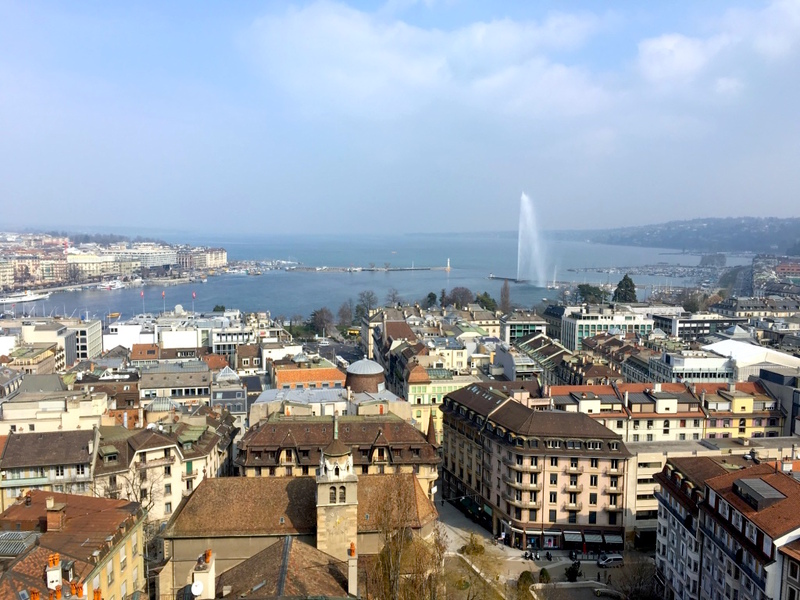 Nonetheless, I have been managing to get by with my limited French proficiency just fine and have figured out the train system well enough to make it into Geneva for some weekend adventures. 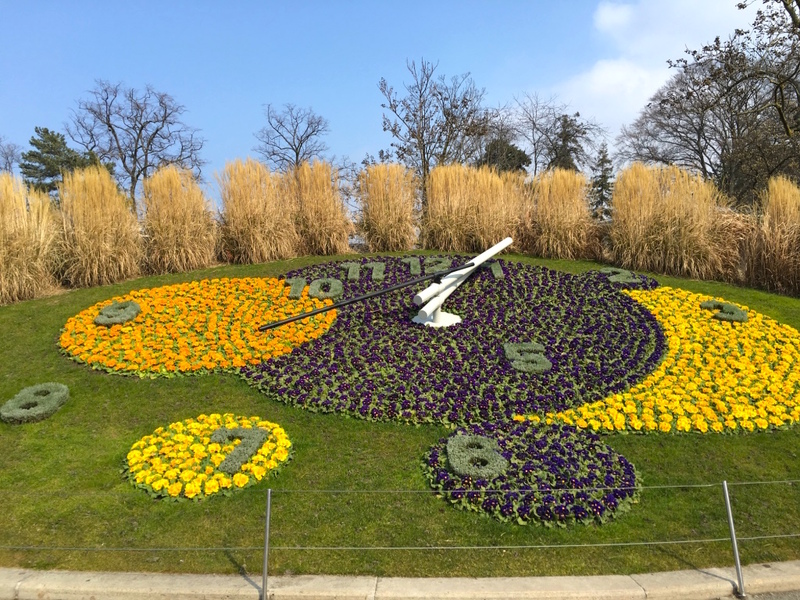 This past weekend I wandered the streets of Old Town Geneva, checked the time at L’Horloge Fleurie (flower clock), meandered through Le Jardin Anglais (English Garden), gaped at the famous Jette d’Eau fountain, and had my breath taken away by the view from atop La Cathédrale Saint-Pierre, although realistically, it could have been the never-ending spiral staircase that initially left me breathless.